Purpose: Post-Descemet stripping endothelial keratoplasty (DSEK) patients are prone for intraocular pressure (IOP) elevations and glaucoma. Corneal characteristics influence various IOP measuring devices in various ways. The aim of this study was to evaluate the agreement between four different IOP measuring devices: Goldmann applanation tonometer (GAT), I-care pro, Tonopen XL, and Schiotz tonometr in patients who underwent DSEK. Methods: This was a prospective comparative study using a convenience cohort of post-DSEK patients with compact grafts. Post-DSEK patients had IOP measured using GAT, I-care Pro, Tonopen XL, and Schiotz tonometer. Measurements were compared and agreement assessed. Wilcoxon signed-rank test was used for comparison of means as variables did not show a normal distribution. Bland–Altman plots were used for assessing agreement. Results: Thirty eyes of 24 patients were included in the study. Mean time from DSEK surgery was 25.31 ± 13.05 months. Mean IOP with GAT, I-care pro, Tonopen XL, and Schiotz tonometer was 13.99 ± 3.76, 13.92 ± 3.36, 13.31 ± 3.89, and 12.83 ± 4.07, respectively. GAT, I-care pro, and Tonopen XL had similar mean IOP measurements (P = 0.135 and P = 0.551, respectively), while Schiotz tonometry measurements were higher (P = 0.046). Bland–Altman plots show good agreement between GAT, Tonopen XL, and I-care pro. GAT and Schiotz tonometry show less agreement, with large variations in the differences of measured IOP. Conclusions: IOP measurements in post-DSEK patients showed good agreement between GAT and either Tonopen XL or I-care pro. Schiotz tonometer has large variations in this patient group. IOP measurements and IOP difference between devices were not dependent on central corneal thickness. Descemet's stripping epithelial keratoplasty (DSEK) is the most common form of endothelial corneal transplantation. DSEK is complicated by ocular hypertension or glaucoma in 11%–47% of the cases.,, Moreover, corneal graft rejection is more common in eyes with glaucoma. Goldmann applanation tonometer (GAT) is the gold standard for intraocular pressure (IOP) measurement. GAT is influenced by corneal characteristics including central corneal thickness (CCT), corneal curvature, corneal rigidity, and corneal hydration.,, DSEK modifies some of these parameters. There are conflicting results concerning the agreement between GAT and different IOP measuring devices in post-DSEK eyes. We compared IOP readings taken with GAT, I-care pro, Tonopen XL, and Schiotz tonometer in post-DSEK patients and assessed agreement between these devices. We conducted a prospective, comparative, single-center study. A convenience cohort of 30 eyes of 24 consecutive patients was used. The study was performed in accordance with the tenets of the Declaration of Helsinki. After receiving detailed explanations regarding the nature of the examinations, all patients signed written informed consent. We included patients who underwent DSEK, had a clear and compact graft, at least 3 months postoperatively. Grafts were considered compact if the entire graft was attached to the receiving cornea, had no Descemet folds and no apparent edema on slit-lamp examination. Patients were excluded if they had an edematous graft, residual corneal sutures, previous corneal refractive surgery, or blepharospasm. Since we intended to examine agreement between devices prior glaucoma surgery, current antiglaucoma agents use or elevated IOP were not considered to be exclusion criteria. All eyes underwent slit-lamp examination, IOP measurement using GAT (Haag Streit, Koeniz, Switzerland), I-care pro (I-care Finland Oy, Vantaa, Finland), Tonopen XL (Reichert, Depew, New York, USA), and Schiotz tonometer (Sklar, West Chester, PA, USA). All devices were calibrated at the beginning of the examination day. GAT, Tonopen XL, and I-care pro measurements were obtained sitting, while Schiotz was performed in the supine position. Ultrasound (US) pachymetry was obtained using the AccuPach VI (Accutome, Malverne, PA, USA). The order of the examinations was slit-lamp evaluation, followed by IOP measurement by I-care pro, Tonopen XL, GAT, and Schiotz tonometer. The order of examinations was constant as we did not want to possibly influence the measured IOP by recent postural changes (in case of the Schiotz tonometry); the order of examinations was of increasing corneal interference, attempting to minimize possible influences on further testing. GAT was repeated three times with 1-min intervals, without reinstituting anesthetic drops. GAT measurements were read from the device's knob by an assistant. I-care pro measurements were repeated twice, with 1-min interval between examinations. Tonopen XL measurements were repeated twice, with a 1-min interval between examinations. Schiotz tonometry was performed thrice: without added weights, with a 5.5 g weight, and with a 7.5 g weight. Measurements were converted to mmHg readings using the company's conversion chart. IOP readings of each of the devices were averaged. US corneal pachymetry was obtained last. If difficulties arose, or the measurement quality was poor, the measurement was repeated. GAT readings were taken as the gold standard. Each device average IOP was compared with GAT readings using the Wilcoxon signed test as variables did not follow a normal distribution. The deviation of each device from the GAT value was calculated and correlated with CCT variable using a linear regression model. The agreement between the GAT and I-care pro, Tonopen XL, and Schiotz tonometry was assessed by the Bland–Altman method. All data were coded into SPSS statistics 20.0 (IBM SPSS Statistics for Windows, Version 20.0. Armonk, NY, USA). Statistical analyses were two-sided, a P < 0.05 was considered statistically significant. We examined thirty eyes of 24 patients who had a successful DSEK at least 3 months before examination (mean 25.31 ± 13.05 months; range 4.76–54.21 months). The mean age was 74.27 ± 9.34 years. Sixty percent were female. Six patients had bilateral DSEK. Antiglaucoma medication was used in 40% (12/30) of eyes at the time of the study. Multiple agents were used in ten patients (33%), with most (9/12, 75%) using beta blockers. One patient used oral acetazolamide (3%). One patient had prior glaucoma surgery (trabeculectomy). Mean IOP readings are presented in [Table 1]. 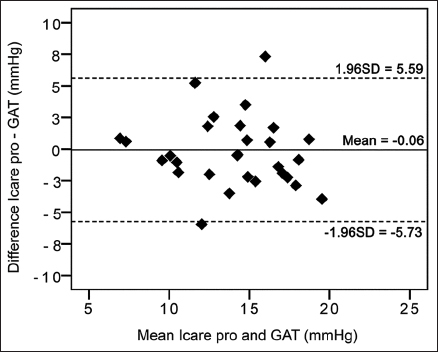 There was no statistically significant difference between GAT and Tonopen XL or I-care pro (P = 0.135 and P = 0.551, respectively; Wilcoxon signed test). 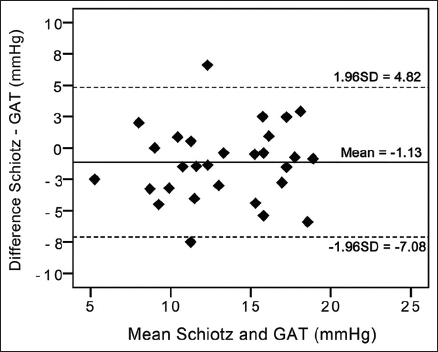 GAT and Schiotz tonometry had a statistically significant difference, with a mean difference of 1.15 ± 3.04 mmHg (P = 0.046, Wilcoxon signed test). IOP measured with GAT, Tonopen XL, I-care pro, and Schiotz tonometer was not correlated with CCT (P values of 0.096, 0.112, 0.402, and 0.083, respectively). We viewed differences of 2 mmHg or less as acceptable, factoring GAT's intrasession repeatability. Differences between 2 and 3 mmHg were viewed as borderline and differences larger than 3 mmHg as significant. Differences in IOP readings between devices are presented in [Table 2]. Seven out of thirty I-care pro readings (23.3%) showed differences larger than 3 mmHg compared to GAT: two measurements underestimated GAT and five of measurements overestimated GAT. Tonopen XL readings showed large differences in 5/30 (16.7%) examinations: 3 readings underestimated GAT and 2 readings overestimated GAT. Schiotz tonometry showed large differences in 11/30 (36.7%) of the readings: 8 readings underestimated GAT and 3 readings overestimated GAT. Concordance is presented in [Figure 1] Mean IOP values obtained in all devices were significantly correlated with GAT (GAT and Tonopen XL [R = 0.834, P < 0.001], GAT and I-care pro [R = 0.675, P < 0.001], GAT and Schiotz [R = 0.70, P < 0.001]). The difference in IOP readings between devices was not significantly correlated to CCT. We did not find a correlation between different IOP levels (measured with GAT) and the difference between Tonopen XL or Schiotz and GAT. Care pro increasingly underestimated GAT as IOP became higher (R = −0.515, P = 0.004). Bland–Altman plots, in which the average of the IOP measurement by two devices is plotted on the X-axis and the difference between devices (Tonopen XL– GAT, Schiotz– GAT, I-care pro– GAT) is plotted on the Y-axis, are presented in [Figure 2], [Figure 3], [Figure 4]. There seems to be a reasonable agreement between GAT and Tonopen XL or I-care pro and less agreement between GAT and Schiotz tonometer. Each device had two readings outside ± 1.96 standard deviation (SD) boundary limit. The difference between GAT and Tonopen XL showed the smallest SD (2.20), followed by I-care pro (2.89). Schiotz tonometry had the largest SD (3.04). Considering the abundance of glaucoma in post-DSEK patients, which reaches almost 50% in some series, accurate IOP readings are important for monitoring patients and influencing treatment decisions. Other than the study by Vajaranant, that evaluated 50 eyes, agreement between IOP measuring devices in post-DSEK patients is addressed in only a number of small studies.,, Tonopen XL, which uses a modified applanation technique, showed good agreement with GAT in a small study of 11 eyes, with a mean difference of 1.2 mmHg. We found that the agreement between GAT and Tonopen XL was better than that of GAT and other devices. 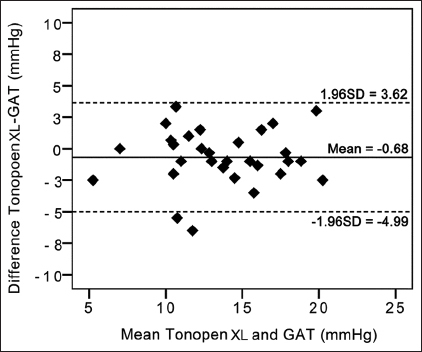 Tonopen XL readings were closest to GAT readings, had fewer occasions of large deviations from the GAT, and had the smallest SD of IOP differences from GAT. The Tonopen's small contact diameter (1.0 mm) is less affected by corneal irregularities, possibly improving agreement with GAT. Both devices utilize the applanation technique so that corneal changes induced by DSEK possibly influence the devices in a similar way. The I-care pro uses rebound tonometry, measuring the device's probe deceleration after contacting the cornea to calculate IOP. While measuring nearly identical IOP in normal and glaucomatous eyes, I-care had contradicting results in patients with corneal pathologies, showing good agreement in one study, but underestimating GAT readings in patients with other corneal abnormalities  and specifically measuring significantly lower IOP than GAT in post-DSEK eyes (4.0 ± 3.3 mmHg lower, 19 patients). This underestimation could stem from difficulties in using GAT accurately in pathologic corneas. One of the advantages of DSEK over penetrating keratoplasty is less corneal astigmatism, making GAT measurement more accurate, boosting agreement with I-care. While we did not find a difference between I-care and GAT in general, we did find an underestimation bias in higher IOP levels. Schiotz tonometry is being less utilized today as other means of IOP measuring became available. Schiotz tonometer measures the indentation created on the cornea by a plunger of known weight to assess IOP. Our results support other studies which found Schiotz tonometer to have a low agreement with GAT and show a large variability in IOP readings in post-DSEK patients. In addition, Schiotz tonometry is performed in the supine position, which could rise the IOP, contributing to the low agreement noticed. CCT is a known modifier of GAT, Tonopen XL, and I-care readings. Post-DSEK patients show an increase in CCT, attributed to the added thickness of the corneal graft. This artificial increase in CCT is not associated with a change in IOP that is seen in normal corneas., This might occur as the added thickness measured does not change the mechanical properties of the cornea the same as would occur in a normal cornea of the same thickness. In our cohort, neither device was correlated with CCT, highlighting this finding. Several correction formulas, mainly incorporating CCT measurement, were reported. The use of such correction formulas is debatable, and a recent report found that the application such formulas did not yield better agreement between GAT and DCT., As our primary goal was agreement between devices, no such correction was utilized in our study. Our study has several limitations, a relatively small cohort, a nonhomogenized patient population, different time intervals from DSEK surgery, and no specific corneal biomechanics information tests, such as corneal hysteresis (measured with an Ocular Resposne Analayser [ORA]) or measurements taken with dynamic contour tonometry (DCT). This, however, does not hamper the levels of agreement between the device. In addition, ORA and DCT measurements are not yet widely spread and are not available in many institutions. Several reports utilizing DCT showed increased accuracy across different CCTs  and could potentially be more accurate in aberrated corneas. Yet, this study is still one of the largest reports of agreement of IOP measuring devices in post-DSEK eyes, with all eyes having a compact graft. We found good agreement between GAT, Tonopen XL, and I-care pro, making all devices useful for measuring IOP in post-DSEK patients, preferably consistently using one method for a specific patient. 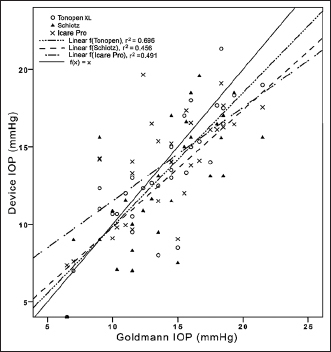 Schiotz tonometry had greater variability in IOP readings and should preferably be avoided. Further studies are needed to better examine the relation between the different IOP measuring methods. 2014 Eye Banking Statistical Report. Washington, DC: EBBA; 2014. Haddadin RI, Chodosh J. Corneal transplantation and glaucoma. Semin Ophthalmol 2014;29:380-96. Maier AK, Klamann MK, Torun N, Gonnermann J, Schroeter J, Joussen AM, et al. Intraocular pressure elevation and post-DSEK glaucoma after Descemet's stripping endothelial keratoplasty. Graefes Arch Clin Exp Ophthalmol 2013;251:1191-8. Müller L, Kaufmann C, Bachmann LM, Tarantino-Scherrer JN, Thiel MA, Bochmann F. Changes in intraocular pressure after Descemet stripping automated endothelial keratoplasty: A retrospective analysis. Cornea 2015;34:271-4. Price MO, Jordan CS, Moore G, Price FW Jr. Graft rejection episodes after Descemet stripping with endothelial keratoplasty: Part two: The statistical analysis of probability and risk factors. Br J Ophthalmol 2009;93:391-5. Liu J, Roberts CJ. Influence of corneal biomechanical properties on intraocular pressure measurement: Quantitative analysis. J Cataract Refract Surg 2005;31:146-55. Damji KF, Muni RH, Munger RM. Influence of corneal variables on accuracy of intraocular pressure measurement. J Glaucoma 2003;12:69-80. Okafor KC, Brandt JD. Measuring intraocular pressure. Curr Opin Ophthalmol 2015;26:103-9. Dielemans I, Vingerling JR, Hofman A, Grobbee DE, de Jong PT. Reliability of intraocular pressure measurement with the Goldmann applanation tonometer in epidemiological studies. Graefes Arch Clin Exp Ophthalmol 1994;232:141-4. Yi K, Bae G, Kong M, Chung ES. Intraocular pressure measured with Goldmann, noncontact, Schiøtz, and dynamic contour tonometry after DSEK. Cornea 2013;32:1089-93. Unterlauft JD, Elsaesser K, Grehn F, Geerling G. Intraocular pressure and trabecular meshwork outflow facility after Descemet stripping endothelial keratoplasty. J Glaucoma 2016;25:263-8. Mawatari Y, Kobayashi A, Yokogawa H, Sugiyama K. Intraocular pressure after Descemet's stripping and non-Descemet's stripping automated endothelial keratoplasty. Jpn J Ophthalmol 2011;55:98-102. Rootman DS, Insler MS, Thompson HW, Parelman J, Poland D, Unterman SR. Accuracy and precision of the Tono-Pen in measuring intraocular pressure after keratoplasty and epikeratophakia and in scarred corneas. Arch Ophthalmol 1988;106:1697-700. Kontiola A. A new electromechanical method for measuring intraocular pressure. Doc Ophthalmol 1996-1997;93:265-76. Moreno-Montañés J, Martínez-de-la-Casa JM, Sabater AL, Morales-Fernandez L, Sáenz C, Garcia-Feijoo J. Clinical evaluation of the new rebound tonometers Icare PRO and Icare ONE compared with the Goldmann tonometer. J Glaucoma 2015;24:527-32. Moreno-Montañés J, García N, Fernández-Hortelano A, García-Layana A. Rebound tonometer compared with Goldmann tonometer in normal and pathologic corneas. Cornea 2007;26:427-30. Rosentreter A, Athanasopoulos A, Schild AM, Lappas A, Cursiefen C, Dietlein TS. Rebound, applanation, and dynamic contour tonometry in pathologic corneas. Cornea 2013;32:313-8. Salvetat ML, Zeppieri M, Miani F, Tosoni C, Parisi L, Brusini P. Comparison of iCare tonometer and Goldmann applanation tonometry in normal corneas and in eyes with automated lamellar and penetrating keratoplasty. Eye (Lond) 2011;25:642-50. Barkana Y. Postural change in intraocular pressure: A comparison of measurement with a Goldmann tonometer, tonopen XL, pneumatonometer, and HA-2. J Glaucoma 2014;23:e23-8. Martinez-de-la-Casa JM, Garcia-Feijoo J, Vico E, Fernandez-Vidal A, Benitez del Castillo JM, Wasfi M, et al. Effect of corneal thickness on dynamic contour, rebound, and Goldmann tonometry. Ophthalmology 2006;113:2156-62. Park SJ, Ang GS, Nicholas S, Wells AP. The effect of thin, thick, and normal corneas on Goldmann intraocular pressure measurements and correction formulae in individual eyes. Ophthalmology 2012;119:443-9. Wachtl J, Töteberg-Harms M, Frimmel S, Roos M, Kniestedt C. Correlation between dynamic contour tonometry, uncorrected and corrected Goldmann applanation tonometry, and stage of glaucoma. JAMA Ophthalmol 2017;135:601-8. Chihara E. Assessment of true intraocular pressure: The gap between theory and practical data. Surv Ophthalmol 2008;53:203-18. Barleon L, Hoffmann EM, Berres M, Pfeiffer N, Grus FH. Comparison of dynamic contour tonometry and Goldmann applanation tonometry in glaucoma patients and healthy subjects. Am J Ophthalmol 2006;142:583-90.